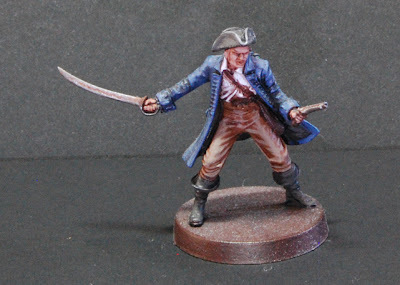 Hey folks, having posted examples of my GW figures over the past week, I thought I'd do something a little different today and put up some examples of minis from some of the independants. Whilst Games Workshop is, by and large, the recognised establishment in the wargaming world, here in the UK, there are some fine alternatives if you're looking around for a bit of a change. I've always referred to them as the indies, but they are great figure manufacturers in their own rights, and here are a few examples. 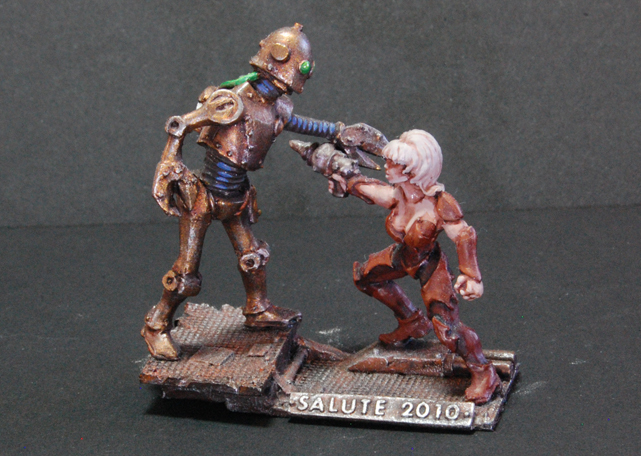 This was a freebie miniature given to the first 4,000 through the gates at Salute in 2010. Salute is a cracking show put on by the South London Warlords each year, and recently it has grown to such a size that it's been hosted at ExCel in London's docklands. This year's event is on the 21st April and you can find out more about it on the Salute website. The model itself was sculpted by one of the guys over at Black Scorpion Miniatures who have a great range. These cowboys also come from Black Scorpion as part of the excellent 'Tombstone' series. 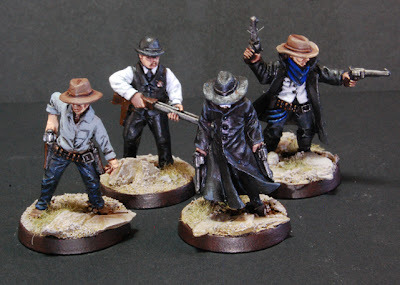 I'll feature my Mexican bandito posse over the next few days. Next up are the guys at Hasslefree Miniatures. I love these figures; the quality of the sculpts has always been excellent and the castings very clean. 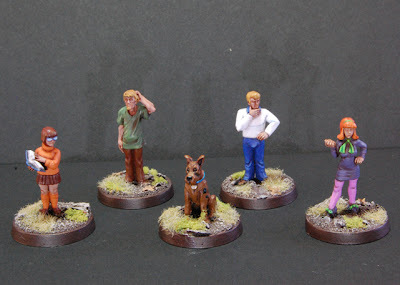 Head on over to their site and have a browse around, there are some really great, slightly quirky models on there and are normally less than £3.50 each, which I think is cracking, considering the excellent quality of the pieces. The adventurer on the left of the picture is sold with a 'mystery (right) arm option' and was very pleased to find it was actually Hellboy, which, coincidentally, I'd been trying to find a figure for, for some time. This guy is a figure which, I believe, HF bought the rights to, rather than design from scratch, although a couple of tweaks were made as the original scabbard caused issues tearing the casting molds. Still a great figure and produced to the normal high standard of the rest of the HF range. 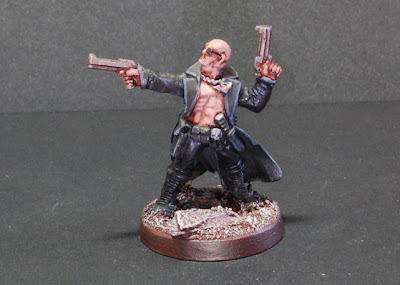 Last up is this bloke from Heresy Miniatures' trenchcoat gang range. 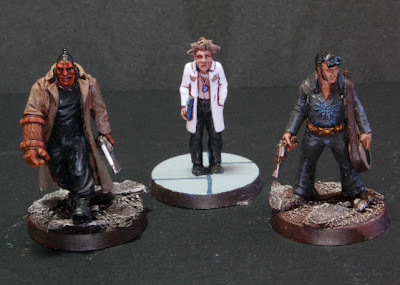 A while back when we were looking at running a Necromunda campaign at the club, several of us looked at these as alternatives to the figures available from GW. Ultimately, I kit-bashed a gang together (I'll pop these on a future post) as I wanted something unique that would be a talking point. However, this is a great range with some really characterful pieces and the Heresy site is well worth a look as well. If there are any Doctor Who fans reading, Heresy produce several incarnations of your favourite time lord. Well, that's it for the day. Laters!